French president Emmanuel Macron pledges to unite divided France. Emmanuel Macron has been sworn in as French president. Emmanuel Macron has taken power as president of France, vowing to restore the country’s status and heal divisions following a bitter campaign the pro-EU centrist fought to defeat a far-right leader. 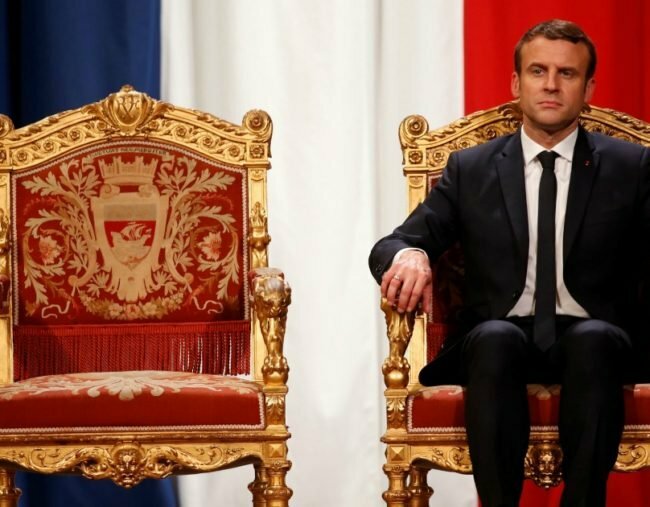 The 39-year-old former investment banker was inaugurated leader of the world’s fifth-largest economy in a solemn Elysee Palace ceremony on Sunday. Macron beat the National Front’s Marine Le Pen in a May 7 run-off vote but the long campaign exposed deep divisions over France’s role in Europe, immigration, and policies to revive a sluggish economy bedevilled by high unemployment. Listen: Macron is married to 63-year-old Brigitte Trogneux, and the world can’t deal. “The division and fractures in our society must be overcome. I know that the French expect much from me. Nothing will make me stop defending the higher interests of France and from working to reconcile the French,” Macron declared in his first words after taking office. Although his victory over Le Pen was comfortable, almost half of France’s 47 million voters chose candidates with views opposed to Macron’s in the first round of the election. Seeking closer ties with EU anchor nation Germany, Macron will meet Chancellor Angela Merkel in Berlin on Monday. Macron becomes the youngest post-war French leader and the first to be born after 1958, when President Charles de Gaulle put in place the country&apos;s Fifth Republic. In a ceremony full of pomp, he was presented with what is effectively his chain of office -- a heavy golden necklace mounted on a red cushion that makes him Grand Master of the National Order of the Legion d&apos;Honneur. But Macron appeared determined to create an impression of personal modesty. Aides went out of their way to emphasise that the dark suit he wore cost about 450 euros ($A676) or just under $US500, and that the lavender outfit worn by his wife Brigitte had been loaned by fashion house Louis Vuitton. He then chose to be driven by military jeep rather than civilian limousine to the Arc de Triomphe, where he stood in the rain, without coat or umbrella, to light the flame in tribute to France&apos;s war dead at the tomb of the unknown soldier -- a powerful reminder of France&apos;s role in the NATO defence alliance.